"Wait, what?" is at the root of all understanding. "I wonder" is at the heart of all curiosity. "Couldn’t we at least?" is the beginning of all progress. "How can I help?" is the basis of all good relationships. And "what truly matters?" gets you to the heart of life. By regularly asking these questions, Ryan promises, you will be prepared to enthusiastically answer "Yes" to one final—and, ultimately, most important—question: "And did you get what you wanted out of life, even so?" In this thoughtful, illuminating book, Ryan builds upon his wildly popular and universally praised address which has been viewed more than four million times online. Wait, What? 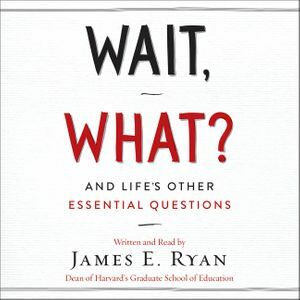 offers further insights into the art of asking good questions, highlighted by hilarious and surprising anecdotes from Ryan’s personal and professional life, as well as stories from politics, popular culture, and social movements throughout history. Engaging and inspiring, Wait, What? will change the way you look at yourself and the world, and, in the process, help you get what you want most out of life.